If you’ve ever sold valuable used goods online, then you know the drill: If you’re selling locally, prepare to deal with Craigslist, bartering with strangers, arranging for a pickup or dropoff, yadda-yadda-yadda. But really, who has time for that? Thankfully, somebody else out there noticed how annoying it is to sell used goods on the Internet, and they did something about it. 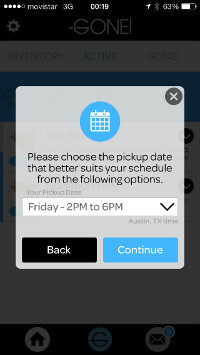 Those somebodies are the creators of the Austin-based startup Gone!, an app maker and second-hand goods retailer that puts the power of consignment selling right in their users’ pockets. For buyers, using the Gone! app is like having thrift store access 24 hours a day, seven days a week. But for sellers, the experience is especially streamlined: Just upload details and images of your item through the app and Gone! will make you an offer. If you accept, your stuff will disappear either that very day or the next — if you’re lucky enough to live in Austin or San Francisco. Once the item is purchased, you get a check in the mail. And if nobody bites, Gone! recycles or donates your stuff and arranges a tax writeoff. It’s that simple. The feisty Austin startup has already attracted a lot of attention and investment capital, thanks in part to its connection to Austin Techstars and its warm reception by the press. So far, Gone! has gotten plugs in CNN, TechCrunch, VentureBeat, The Austin American Statesman and The San Francisco Chronicle, to name just a few of the outlets that have covered Gone!. Right now, Gone! is only available to iOS users, but Bayerque assured us that Android is very important to the company. “The full functionality of our app on Android is a top priority to us, but we want to make sure that we have the right user experience,” he said. As for why Gone! launched in Austin and later expanded to San Francisco — instead of the other way around — Bayerque explained it is because of the technology culture that’s developed within the city. Featured photo: Flickr user Tax Credits, creative commons licensed.